It’s artichoke season in Israel! They’re very expensive though and the hubby isn’t crazy about them, hence perfect for a light lunch for just me at home. I love love love artichoke, but my usual dipping sauce is something with mayonnaise or cream and I’m trying to stay away from that as much as possible. I was thinking of alternatives, and flipping through my feed I kept seeing deliciously runny egg yolks -💡- dip the artichoke leaves in yolk! I set out to try my experiment and was amazed at how delicious it turned out! I brought a small pot of water infused with half a lemon and 2 crushed garlic cloves to a boil. I lowered it to a simmer, added in the artichoke and simmered for around 30 minutes. Once an outer leaf was easily torn off, I removed the artichoke and spilled out the water, added fresh water and brought that to a boil again. I lowered it to a simmer, added a splash of vinegar and slowly lowered a cracked egg. I set a timer for 3 and a half minutes. Meanwhile, I removed the inner leaves of the artichoke creating a well, also making sure to remove all the ‘hair’ above the heart, but preserving the leaves. When the timer finished, using a slotted spoon I removed the egg and placed it onto paper towels to drain. 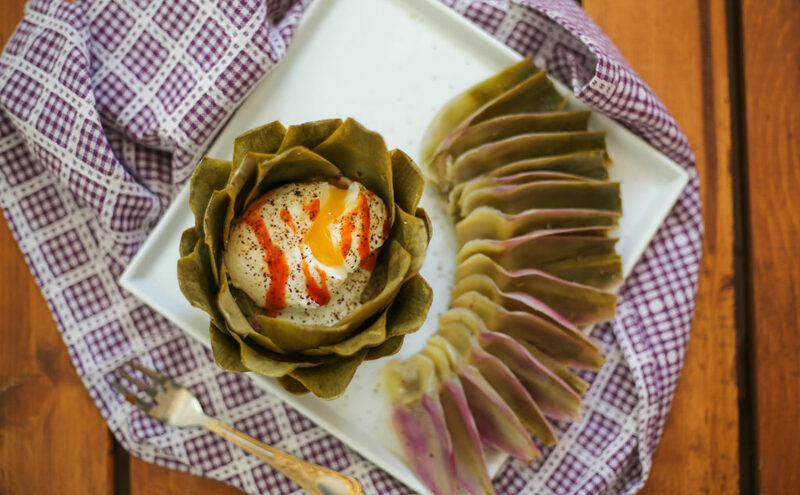 I gently placed the egg in the artichoke center, seasoned with sea salt, sumac, freshly ground black pepper and drizzle some sriracha. I cut open the runny yolk and dipped all the leaves into it!